June | 2008 | What's in a Smile? It’s true! 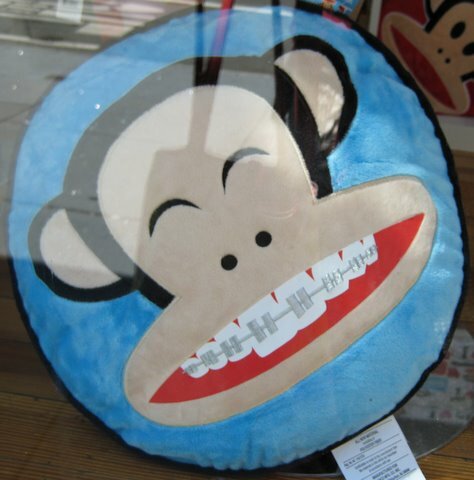 I was waiting for the bus the other day, and saw this monkey with braces! Last weekend, I saw a friend for the first time since she got her braces taken off, a couple of monhts ago. Both of us were NOT wearing our retainers. Because we were at a foodie-event, where we knew for sure that we would be nibbling on some really good food. And that pretty much sums up why for me and my friend, wearing our retainers all the time is pretty challenging. There you go. Of course, I could flip this whole thing into a diet strategy… the thought has crossed my mind, but hasn’t worked so far. I wrote about this in yesterday’s post-braces report, but think it’s worth mentioning again. At my last ortho appointment, I asked one of the technicians if she could sonic clean the retainers; the doctor has mentioned this last time I was there. “No problem”, she said, and took the retainers. When I was ready to leave after about 15 minutes, they were done and looked great! They use the machine they use to clean their instruments. I don’t know if all ortho offices will offer this, but it can’t hurt to ask. Last week I went in to see my orthodontist for a post-treatment debrief. I had to ask for this; he forgot to do at the last meeting. It was a chance for me to see my “after” photos. My doctor on took a few minutes to talk about this, but I usually stick it out for a few more questions. Remember YOU ARE YOUR BEST ADVOCATE. You have a right to get your questions answered. So, we could see from the photos that my cross bite had been fixed. And that where my teeth had sort of caved in — from my first braces treatment, and my teeth moving — now they are out and aligned. How much I should wear my retainers: I should wear them enough so that when I put the retainers back in after not wearing them, they are not tight. I’ve been trying to be aware of this and pay attention to how much time passes; not too successful yet. But this information was definitely more helpful than “wear them all the time”, which hasn’t been happening for me. How the teeth settle after a while. I complained that my bite felt weird; the molars don’t seem like they fit. So when I have the retainers on, everything feels fine. But when I take them off, it seems like the teeth are too far apart. Apparently over time — and after this period during which I’m supposed to wear the braces all the time–the teeth will eventually settle in and fit each other. Oh, also, when I arrived I asked one of the technicians if she could sonic clean the retainers. “No problem”, she said. When I left after about 15 minutes, they were done and looked great! They use the machine they use to clean their instruments. I don’t know if all ortho offices will offer this, but can’t hurt to ask. I guess I’m feeling guilty. And maybe worried. I haven’t been wearing my retainers all the time like I’m supposed to. I wear them every night, but I, um, forget to put them back on after breakfast. So when I do put them on at night, the top one is really tight. As long as I can get them on at night it’s OK, right?